I'm spending the week at the Congress of the International Union of Game Biologists, meeting in Barclona, Spain. I won't complain about the setting of this meeting--it is a great town--but, there are problems that arise when you attend meetings like this. You get too many ideas to ever actually work on them. And, you tend to get 'data set envy' when you see presentations from countries around the world. I encountered such envy when I saw Nicholas Aebischer present a plenary talk about the Game and Wildlife Conservation Trust's long-term data sets of several species of pheasant-like game birds in the UK. I will start by noting that my colleagues and I are excited if we can access data that goes back to 1966 (Breeding Bird Survey) or 1955 (Nebraska Rural Mail Carrier Survey). In one case, I've worked with data from the Agriculture Statistics Service that went back to 1866...a record of crops planted in Nebraska. But, the GWCT in the UK has a 'bag record' (an index of the population from hunter harvests--the 'bag' counts from hunts like the one in the print at right) of grey partridge that reaches back to 1826. Wow. 1826! That's a long-term wildlife data set...! 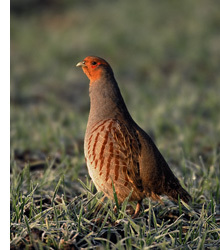 "Gray partridge bags form the longest series in the NGC. We were able to produce trends in annual bag density that started in 1826, when Darwin was only 17 years old. There are large annual fluctuations, most probably linked to weather. Indeed, the collapse of bags in 1869 corresponds to the coldest year on record since 1740. Despite large swings from year to year, the underlying pattern (green line) charts the rise in popularity of this gamebird during the first half of the 19th century and its heyday during the second half of that century up to the First World War. The high average bags reflect the high densities arising from the extensive mixed agriculture that developed especially after the repeal of the Corn Laws in 1846, the ruthless elimination of predators by private gamekeepers and improvements in shotgun design. 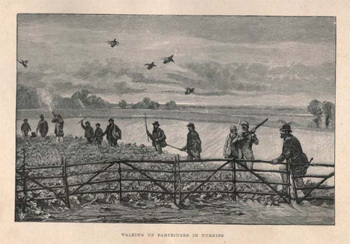 Partridge bags remained high until the Second World War, but declined thereafter, especially after the introduction of herbicides and the increase in agricultural mechanisation in the 1950s and 1960s. The BTO index (inset) starts in 1966, and catches the tail end of the decline." The bag index of grey partridges, as collected by the Game and Wildlife Conservation Trust in the UK. When we look at our declines of wildlife populations in the US--from records that start in the 50's or 60's (like the period of time in the inset on the figure above)--we always wonder "what did populations look like prior to the 50's and 60's? How much change had they seen prior to when we started keeping records?" I would guess that some species in Nebraska would mirror the partridge trends from the UK--because our Nebraska agriculture was following a similar pattern at the same time. But, it's just a guess---because the data doesn't exist. Our view is blocked: an evolutionary response? I’m sitting in my hotel in Barcelona and, of course, I did not receive a room overlooking the Mediterranean. Instead my room looks up at the hills surrounding the city. I’m not sure I’ve ever been given the prime room in a hotel, but in this case I would probably rather gaze at the greenery. The hills are beautiful and rolling, and they remind me a bit of the small mountains that surrounded our family when we lived in Windhoek, Namibia. Why is that? Why do we have a knee-jerk reaction to landscape alteration when it blocks our view? The more I thought about this, the more it intrigued me. We, as humans, don’t react much when a prairie is plowed and fragmented by farming—that is progress and it feeds the world. We don’t react strongly when we know that our neighbor is dumping oil or chemicals in his backyard—even though it might reach the groundwater. It’s his backyard, and he can do what he wants. I grew up on a farm in southern Iowa. If you want to send your neighbors talking, put a new shed on a hilltop. Or, better yet, tear down a barn that has always been there. Or, plant your crops in strips (as my father did) rather than in big blankets of boredom. Do something to change the way the neighborhood ‘looks’ and you might get a comment the next time you’re in the farm-and-home store. At the least, people will drive by your place slowly. This interests me, because I’ve been thinking for the past couple of years about wind energy. Our lab may become involved in research on how wind energy affects prairie-chicken populations—there is concern that placement of towers in Nebraska’s contiguous grasslands could disrupt movements, affect choice of nesting locations, or affect survival of adults. Again, interesting—we should probably be more concerned about timing of haying that affects chicks and their bullsnake predators. Or, we might choose to be wary of the ever-slow encroachment of cedar trees that provide cover for predators. But, those things are not visual, or they happen so slowly that we don’t realize it is happening. But, a wind turbine is something to get excited about. 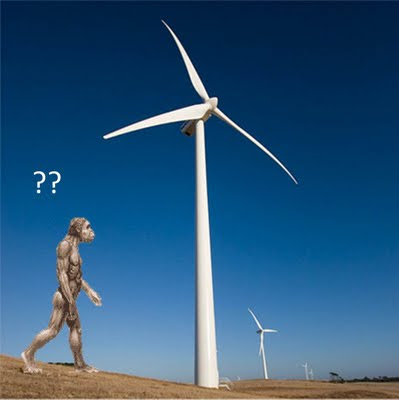 Why do we shy away from wind turbines? I’m starting to think that it is mostly all about our view. They are going to change the way that our grass-scapes look, and we don’t like that. Something bugs us. We have this aversion to our view being blocked. Never mind the fact that you are driving in the middle of a pack of 6 semi-trucks and 18 cars who can’t decide who is going to go first and who can’t get their cruise control set at a constant speed. 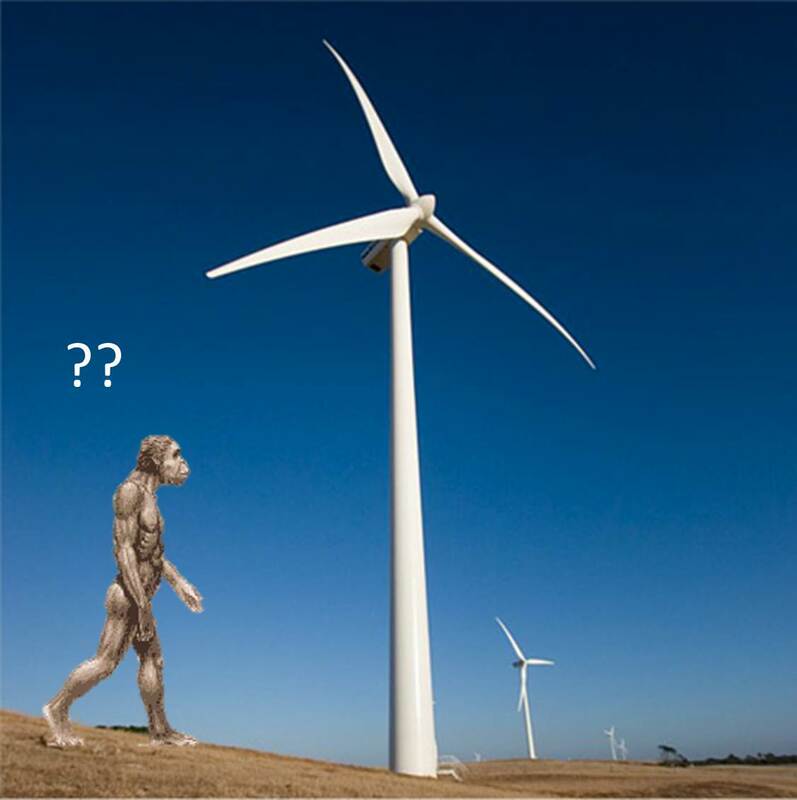 No, it’s the wind turbines that disgruntle us. The real risk of danger to our lives is the cars around us, but our gut responds to the change in the viewscape. I’ll hazard a guess that humans are hard-wired, through evolutionary time, to respond to changes in our viewscape. We know that our eyes are one of our most important senses, and we pick up on visual cues pretty quickly, compared to other mammals (even I can hide from a deer in an open field if I stand still). For our cave-man Homo ancestors, and Australopithecus before them, a change in the viewscape probably was the best cue to be on your guard for predators or competitors. So, it probably stands to reason that we are uncomfortable at the notion of our landscape being altered by big towers with blades on them. The question is—is the cue a false cue? Or, should we listen to our gut? I’m still wondering, as I look at the hills of Barcelona. Note: I created the conglomeration imagery above. My apologies to their original owners.